Back after a field trip to Papua New Guinea Bookleteering with a traditional indigenous community in the jungle, March and April’s issues of the Periodical comprise two more books in the Magna Carta series and another Librarypress book. Issue 30’s The True Leveller’s Standards Advanced ((1649) & the Charter of the Fundamental Rights of the European Union (2000) contains two key documents that set out the basis for a new social contract, one written (but not applied) in the mid 17th Century, the other now part of the basis of European citizenhood. 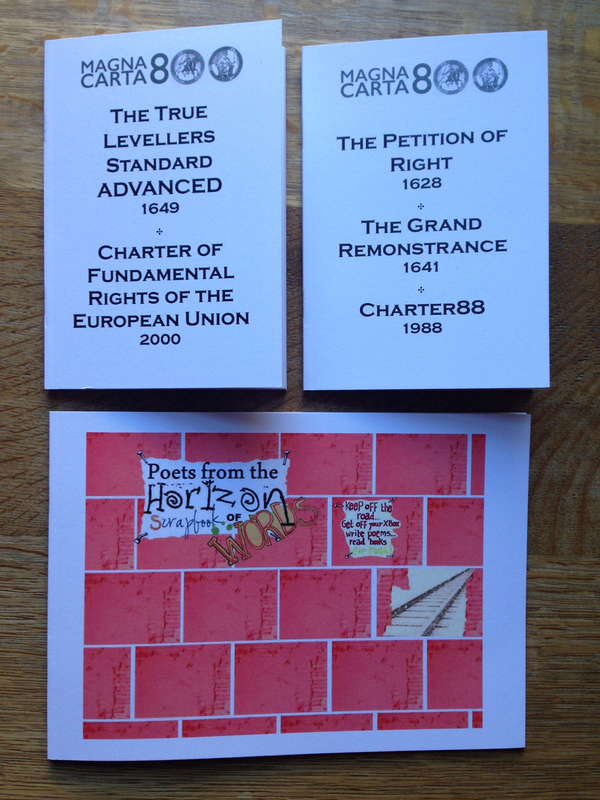 Issue 31’s The Petition of Right (1628), Grand Remonstrance (1641) & Charter88 (1988) the fourth in my Magna Carta series, juxtaposes two 17th Century texts challenging the power of the king up to the eve of Civil War, with a near contemporary text highlighting the deficiency of Britain’s democracy still lacking a written constitution. Also included in issue 31 is Poets from the Horizon: Scrapbook of Words containing young people’s creative writing generated at the New Horizons Youth Centre with support from Camden Libraries and Better World Books.